Recover, remove or circumvent passwords protecting documents created with a variety of office suites. Break passwords to Microsoft Office documents and files in OpenOffice, Apple iWork and Hangul Office formats. Even if your documents don’t fall into the instant recovery category, their protection may be removed automatically in less than 10 minutes. Just click ‘Open’, and Advanced Office Password will quickly perform all the steps to speed up the recovery, and to unlock your documents completely automatically. 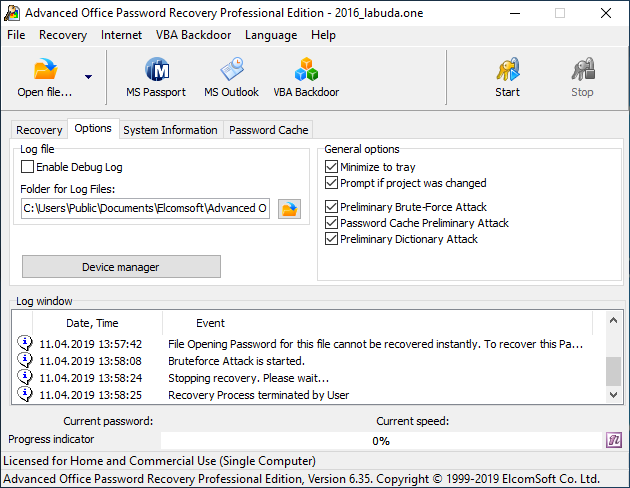 Advanced Office Password Recovery performs a preliminary attack on the password, attempting to unlock the document with commonly used passwords and passwords based on dictionary words. Your document may be recovered without any extra effort in just a few minutes! With latest versions of popular office suites such as Microsoft Office 2019 implementing the strongest security, brute force attacks become painfully slow and ineffective even in GPU-accelerated environments. 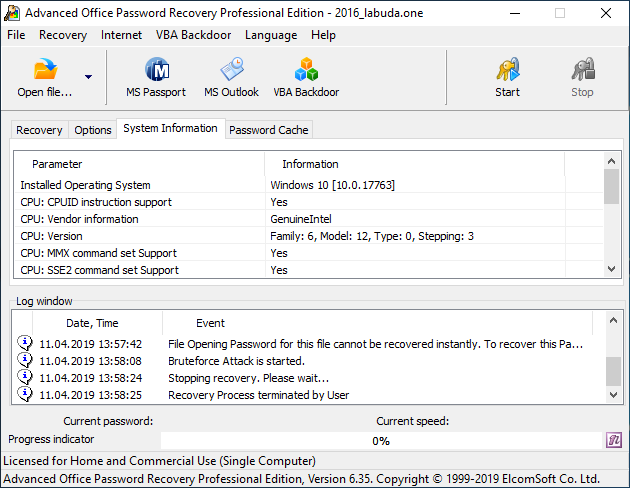 The limited recovery speed of Microsoft Office 2019 passwords required the use of a smarter approach than brute force or simple dictionary attacks. With truly random passwords now taking near infinite time to recover, Advanced Office Password Recovery employs a social engineering approach and implements smart attacks targeting human psychology. Elcomsoft Advanced Office Password Recovery makes use of every bit of information you know about a password. Just specifying your company security policy can increase the speed of the attack tenfold. Remember how many characters your password had, or that it was certainly longer than a certain length? Sure your password had numbers or letters, or both? Maybe you can recollect the first or the last character, or remember whether it was a letter or a number? Every little bit of extra information helps to speed up the recovery. Most passwords used by human beings are based on a single word or a combination of words from a certain language. 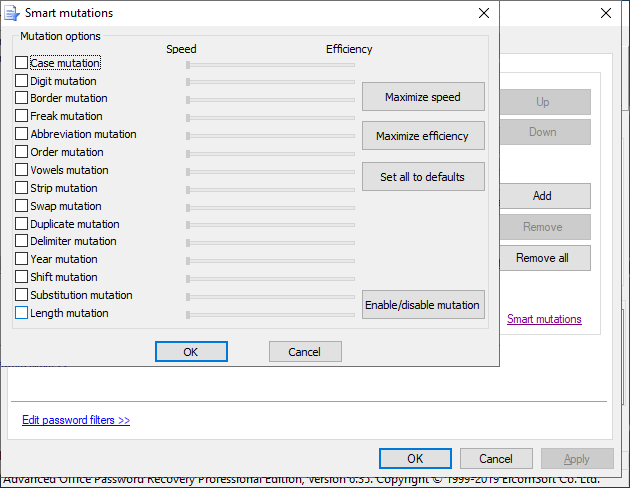 Before reverting to the brute force attack, Advanced Office Password Recovery performs a full-scaled comprehensive attack based on a dictionary. 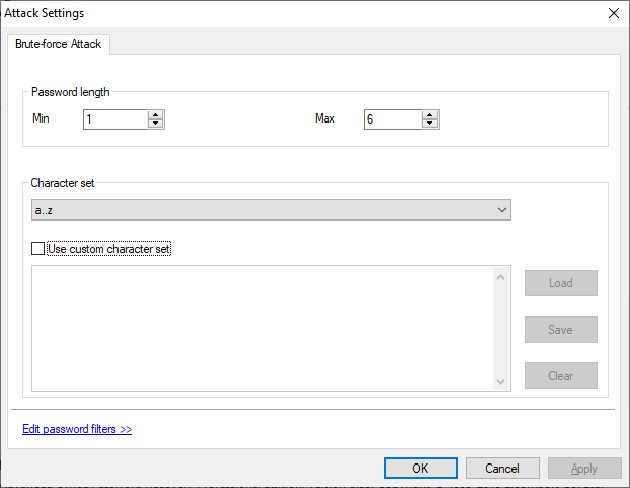 Use a small built-in dictionary or specify your own dictionaries no matter the language, and Advanced Office Password Recovery will attempt single words and word combinations in different cases and variations. Elcomsoft Advanced Office Password Recovery is the industry leader implementing highly sophisticated types of attacks. Dictionary attacks are accompanied with mutations that substitute, duplicate or modify password characters in a way used by typical computer users to increase their password strength. Mask attacks allow putting any knowledge about the password to work. However little is known about the password, every little bit of information helps reduce the number of passwords to try. By specifying the approximate length or structure of the password and entering characters that were used or not used, an expert can reduce the number of passwords to try by a great deal. Combination attacks allow combining dictionary words from two different dictionaries, automatically adding separators as needed. Finally, the Hybrid attack enables experts to create extremely flexible rules describing passwords that were likely to be chosen by a particular user. The rules are described in a file in a format compatible with industry-standard password recovery tools. More information about advanced attacks is available in a Knowledge Base article. If you’re blank about the password, Advanced Office Password Recovery will revert to the last resort: the brute force attack. 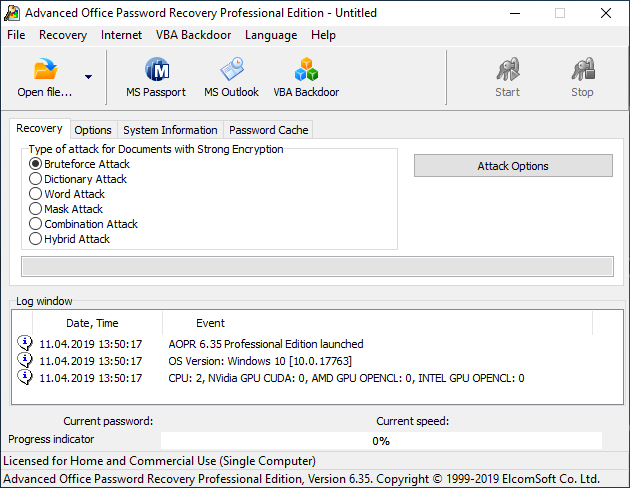 Thanks to the highly optimized low-level code Advanced Office Password Recovery provides the best-in-class performance for the brute-force password recovery. If your documents have been saved in Microsoft Word or Excel 97/2000, or if one used Office XP/2013 in default compatibility mode, guaranteed password removal is possible with Advanced Office Password Breaker. The majority of documents are still saved in this format, protected with weak 40-bit encryption Attacking the 40-bit encryption keys is not just significantly faster than trying all possible combinations of letters and numbers, but guarantees the recovery of your documents within a limited period of time. More information: Advanced Office Password Breaker.